A little warm, and a little wet out, but this September hunt test was still a chance to watch some bird dogs work. AKC Hunt tests are usually held on the grounds of a private facility - where there may be a clubhouse or other structure - or at public facility, such as this event, at the McKee-Beshers preserve along the Potomac, where the pavillion serves as a hub for the event's activities (including the all-important BBQ vendor). A handler and her very pleased Irish Setter head out to the Junior Hunter course. Practicing a little patience at the end of a check cord, a Weimaraner waits with his handler near the breakaway for the juniors. He's looking over his shoulder at the bird field, where the action is. Having just observed a run by two dogs, the junior course's judges talk over their scoring as they ride back to the line to fall in behind the next brace. At the same time, the planter is walking out to the bird field with a bag of quail to replace those that were flushed up in the last round. - and hams it up for the camera. Nothing like a qualifying leg at a hunt test to make both handler and dog happy. Over at the Senior/Master course, a judge has a word with a handler, and resets her stopwatch. Dogs have to be in play for a certain amount of time - no more, no less - and depending on how things are going, that can feel like mere seconds, or forever. Working down the back course in a master brace. 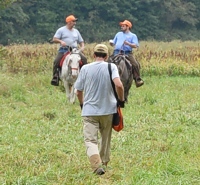 Handlers are required to carry a gun or suitable prop, which they will not shoot, but which they must pretend to shoot in the bird field. That's to make sure that swinging a gun up on a flush doesn't cause the dog to jump the bird - an expected sign of steadiness. 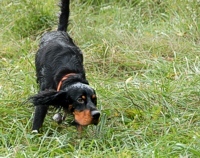 In a senior test, the backing dog can be physically collared while his bracemate works a retrieve. Here, a Weim's handler is crouching (below gunning level) and reinforcing his dog's honor while the other dog's handler moves to flush the pointing dog's chukar partridge for the gunners. A handler approaches her pointing Vizsla while a judge looks down from her very good vantage point. The Vizsla's handler is staying out in front of the dog's line of sight to help keep it staunch on the chukar it's pointing as the gunners move into position. Once everything's in place, she'll kick up the bird for the retrieve part of the test. No matter how many times you've handled your dogs through a test, there's always somebody you're wanting to fill in on the details before the pup's even back in the truck. Qualifying in the test or not, there's always something to learn and plenty of stories to tell.